The assertion that "truth isn't truth," made by a personal attorney for President Donald Trump, tops a Yale Law School librarian's list of the most notable quotes of 2018. Rudy Giuliani's statement came in an August interview on NBC's "Meet the Press" when he told host Chuck Todd that Trump might "get trapped into perjury" if he were interviewed in special counsel Robert Mueller's Russia investigation. 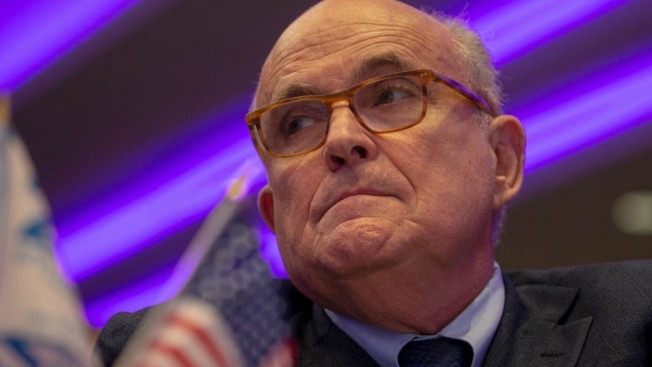 When Todd replied: "Truth is truth," Giuliani responded: "No, it isn't truth. Truth isn't truth." Giuliani later explained he was trying to make the case that having Trump sit down for an interview with Mueller's team wouldn't accomplish much because of the conflicting nature of witnesses' recollections. It was one of several Trump-related quotations on the list assembled by Fred Shapiro, an associate director at the library. The yearly list is an update to "The Yale Book of Quotations," which was first published in 2006. Shapiro chooses quotes that are famous or revealing of the spirit of the times, and not necessarily eloquent or admirable. 1. "Truth isn't truth." — Rudy Giuliani, interview on "Meet the Press," Aug. 19. 2. "I liked beer. I still like beer." — Brett Kavanaugh, U.S. Senate Judiciary Committee testimony on his Supreme Court nomination, Sept. 27. 3. "While all pharmaceutical treatments have side effects, racism is not a known side effect of any Sanofi medication." — Sanofi drug company, in a tweet responding to Roseanne Barr's blaming of their product Ambien in explaining a tweet that led ABC to cancel her show, May 30. 4. "We gather to mourn the passing of American greatness, the real thing, not cheap rhetoric from men who will never come near the sacrifice he gave so willingly, nor the opportunistic appropriation of those that live lives of comfort and privilege while he suffered and served." — Meghan McCain, eulogy for John McCain, Sept. 1. 5. "We're children. You guys, like, are the adults. You need to take some action and play a role. Work together, come over your politics and get something done." — David Hogg, a survivor of the Parkland, Florida, school shooting, in a CNN interview, Feb. 15. 6. "(I am) not smart, but genius ... and a very stable genius at that!" — President Donald Trump, in a tweet, Jan. 6. 7. "You don't have to agree with Trump but the mob can't make me not love him. We are both dragon energy. He is my brother. I love everyone." — Kanye West, in a tweet, April 25. 8. "Our country is led by those who will lie about anything, backed by those who will believe anything, based on information from media sources that will say anything." — James Comey, in a tweet, May 23. 9. "I have just signed your death warrant." — Judge Rosemarie Aquilina, addressing former USA Gymnastics doctor Larry Nassar upon sentencing him to up to 175 years in prison for sexual assault, Jan. 24. 10. "If you see anybody from that Cabinet in a restaurant, in a department store, at a gasoline station, you get out and you create a crowd! And you push back on them. And you tell them they're not welcome anymore, anywhere." — Rep. Maxine Waters, in remarks at a rally in Los Angeles, June 23.